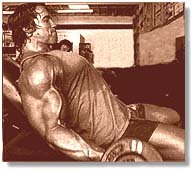 Did you ever wonder where Arnold Schwarzenegger and other hard-core body builders train? Then come to the original Gold's Gym in Venice, "The Mecca of Bodybuilding." Gold's Gym is the most famous gym in "Muscle Beach" (a.k.a. Venice, California), the prime spot to pump some serious iron. This world-renown gym has produced countless champion bodybuilders. It offers 47,000 square feet of Nautilus machines and free weights; its walls are lined with floor-to-ceiling mirrors. At any hour, there are hundreds of serious bodybuilders lifting weights at Gold's to a rock & roll beat. Gold's Gym was the site of the landmark 1977 film, "Pumping Iron," which introduced Arnold Schwarzenegger to the movie-going public. It has also been the scene of various body-building contests, including one notable Mr America competition where Mae West helped congratulate the winners. Gold's members have included: Muhammed Ali, Marcus Allen, Rosanna Arquette, Ellen Barkin, Angela Bassett, Lisa Bonet, Matthew Broderick, Pierce Brosnan, James Caan, Nicolas Cage, Dean Cain, Wilt Chamberlin, Andrew Dice Clay, Nadia Comaneci, Billy Crystal, Tony Curtis, Billy Ray Cyrus, Tony Danza, Geena Davis, Dana Delany, Laura Dern, Kirk Douglas, Richard Dreyfuss, Faye Dunaway, Roberto Duran, Morgan Fairchild, Lou Ferrigno, Ralph Fiennes, Laurence Fishburne, Carrie Fisher, Jane Fonda, George Foreman, Jodie Foster, Teri Garr, Mel Gibson, Whoopi Goldberg, Jeff Goldblum, Gene Hackman, Mark Harmon, Lisa Hartman, David Hasselhoff, Rutger Hauer, Goldie Hawn, Gregory Hines, Hulk Hogan, Evander Holyfield, Dennis Hopper, Helen Hunt, Kareem Abdul-Jabbar, Bo Jackson, Janet Jackson, Reggie Jackson, Samuel L. Jackson, Bruce Jenner, Magic Johnson, Michael Jordan, k.d. lang, Kay Lenz, Howie Long, Greg Louganis, Kyle MacLachlan, Barbara Mandrell, Penelope Ann Miller, Matthew Modine, Kate Moss, Chuck Norris, Ken Norton, Ed O'Neill, Bill Paxton, Ron Pearlman, Michelle Pfeiffer, Chynna Phillips, Bronson Pinchot, Joe Piscopo, Gabrielle Reece, Keanu Reeves, Judge Reinhold, Mary Lou Retton, Eric Roberts, Dennis Rodman, Linda Ronstadt, Pete Rose, Roseanne, David Lee Roth, Mickey Rourke, Kurt Russell, Arnold Schwarzenegger, Charlie Sheen, Garry Shandling, Martin Sheen, Brooke Shields, Wesley Snipes, Kevin Sorbo, Sylvester Stallone, Frank Stallone, Peter Strauss, John Tesh, Heather Thomas, Isiah Thomas, Charlene Tilton, Ben Vereen, Jean-Claude Van Damme, Mark Wahlberg, Jimmie Walker, Fred Ward, Damon Wayans, Carl Weathers, Chuck Woolery, and more. Gold's Gym opens at 5 AM and stays open until midnight each day of the week (except on weekends, when they open at 4 AM). Getting there: The gym is located in Venice, at the northeast corner of Hampton Drive and Sunset (three streets inland from the beach), one block south of the Rose Cafe (a restaurant where Arnold has been known to drop by for a snack). There is an abstract, colorful mural (advertising Gold's Gym) across the street, in their southern parking lot. / From the Santa Monica (10) Freeway take the Lincoln Boulevard exit. Head south on Lincoln (about a mile and a half) to Rose Avenue. Turn right (west on) Rose and go a half mile west to Hampton Drive (just before Main Street). Turn left (south) on Hampton and go one block south. The gym will be on your left (east) side.